ResinLab is pleased to offer a new line of Methoxyethyl Cyanoacrylates (MECA) to complement its line of more standard Ethyl Cyanoacrylates (ECA). These new MECA instant adhesives are possible due to a new patented manufacturing process. This revolutionary new process produces a much higher yield and much purer monomer than previous processes for making MECA monomers. The result of this new process is a lower cost than other MECAs as well as adhesive performance never seen in a conventional MECA instant adhesive. For the first time, you have the benefits of no odor, low bloom, and non-irritating Methoxyethyl CA together with the fast fixture times and high strength bonds previously only available with Ethyl Cyanoacrylates. 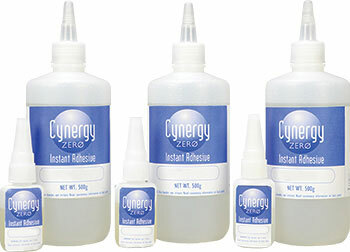 Further Cynergy Zero maintains this performance over the shelf life one year due to a new proprietary stabilizer. 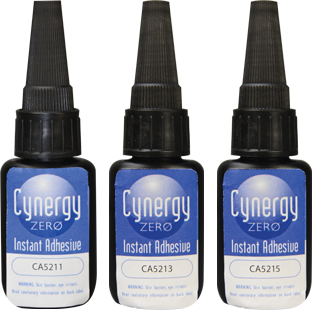 In addition to the traditional moisture cure MECA instant adhesive, ResinLab now offers another line of Cynergy Zero that employs a dual cure mechanism of both light and moisture. A small exposure to almost any UV light source will cure this MECA instant adhesive. This allows for even faster fixture times and higher throughput. The Cynergy Zero Light Curing Instant adhesives will cure almost instantly and in deeper sections than dual curing ECA Instant adhesives currently available. ResinLab offers the only MECA Light Curing adhesives available on the market so you have all the advantages of MECA with no odor, no blooming (with UV cure), and non-irritating. These light curing MECAs also have the same proprietary stabilizer that ensures top performance throughout the shelf life of the product. Contact an experienced representative for more information on ResinLab Cynergy Zero products or request a quote.